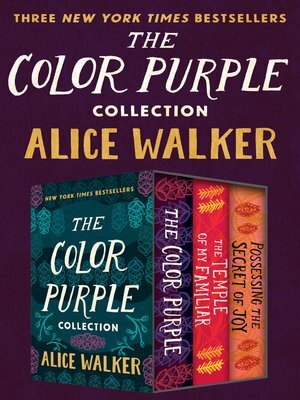 Three powerful novels by bestselling author Alice Walker—beginning with her Pulitzer Prize–winning The Color Purple—that speak to the African experience in America. The Color Purple is Walker's stunning, Pulitzer Prize–winning novel of courage in the face of oppression. Celie grows up in rural Georgia, navigating a childhood of ceaseless abuse. Not only is she poor and despised by the society around her, she's badly treated by her family. As a teenager she begins writing letters directly to God in an attempt to transcend a life that often seems too much to bear. Her letters span twenty years and record a journey of self-discovery and empowerment through the guiding light of a few strong women and her own implacable will to find harmony with herself and her home. In The Temple of My Familiar, Celie and Shug from The Color Purple follow the lives of a brilliant cast of characters, all dealing in some way with the legacy of the African experience in America. From recent African immigrants, to a woman who grew up in the mixed-race rainforest communities of South America, to Celie's own granddaughter living in modern-day San Francisco, all must come to understand the brutal stories of their ancestors to come to terms with their own troubled lives. Possessing the Secret of Joy portrays Tashi's tribe, the Olinka, where young girls undergo circumcision as an initiation into the community. Tashi manages to avoid this fate at first, but when pressed by tribal leaders, she submits. Years later, married and living in America as Evelyn Johnson, Tashi's inner pain emerges. As she questions why such a terrifying, disfiguring sacrifice was required, she sorts through the many levels of subjugation with which she's been burdened over the years. Hailed by the Washington Post as "one of the best American writers of today," Alice Walker is a master storyteller and a major voice in modern literary fiction.